In American horse racing, the Triple Crown (Kentucky Derby, Preakness Stakes, Belmont Stakes) is the best prize one can hope to achieve. This year, Justify managed to capture the elusive Triple Crown after his latest victory at the Belmont Stakes. Justify becomes the second horse to win the Triple Crown in 4 years; American Pharoah claimed the prize back in 2015. Only 12 horses had won the Triple Crown before Justify claimed the 13th installment. There was a 37-year drought before American Pharoah won in 2015, showcasing how difficult it is to win all 3 races. Justify showed his fortitude by winning the Belmont Stakes by 1 ¾ lengths over second-place Gronkowski. He won the Kentucky Derby by 2 ½ lengths and the Preakness Stakes 2 weeks later by ½ a length. On top of the impressive victories are how he achieved those victories. Justify fell under Apollo’s Curse. According to this curse, no horse had won the Kentucky Derby that hadn’t raced as a 2-year-old since Apollo in 1882. Despite being the favorite heading into the Derby, some bettors stayed away from Justify because of this curse. Justify was able to win by a convincing margin and show he was the real deal. He did bruise his heel in the process, which factored into the Preakness expectations. The Preakness Stakes was met with heavy rainfall and dense fog. If that weren’t difficult enough, Justify’s bruised heel looked like it could slow him down. However, the thoroughbred pushed through and pulled off a close victory to secure the second jewel. The Belmont Stakes would be the biggest test of them all. With 2 jewels in place, Justify had a target on his back. The Belmont often sees the return of several horses that rested during the Preakness and that is exactly what happened here. Vino Rosso was a major competitor and had a good chance of winning the race. Gronkowski ended up being a sleeper threat and almost pulled off the victory. Justify’s pole position didn’t help things either, as the horse had potential to be trapped up against the railings if he didn’t break out well enough. Justify did manage to break well and pushed out in front. Restoring Hope, Justify’s stablemate and fellow trainee of Bob Baffert has been singled out as a possible blocker for Justify, but that isn’t necessarily against the rules and worked well as he was able to keep Vino Rosso from making an impact. Bob Baffert became the second trainer in history to win 2 Triple Crowns. He seemed more pleased with the fact that Justify was the winner, considering how much pressure the horse has been on. Belmont marked his 6th race in 4 months, meaning Justify’s workload has been quite intense. Baffert attributed the horse’s toughness as the main contributor to his success, and jockey Mike Smith also gave all the credit to Justify. It appears that Justify’s racing isn’t done yet, but no series of races will ever compare to what he pulled off over the course of the 2018 Triple Crown series. Justify etched his name into the history books and won his staff a lot of money in the process. 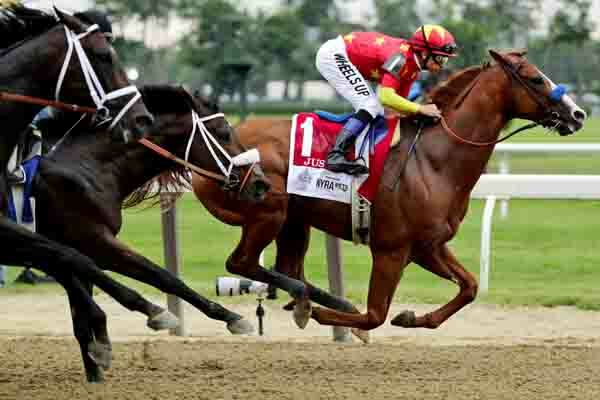 When people look back on Triple Crown victors, Justify will be ranked amongst the greatest of all time.